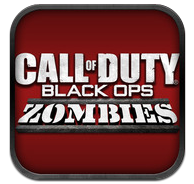 Call of Duty: Black Ops Zombies (v1.2.1) — Mobers.ORG — Your Daily Source For Mobile FUN! Adapted from the best-selling console hit and built specifically for tablets and smartphones, Call of Duty: Black Ops Zombies delivers maps and weapons never before seen on mobile, and 50 levels of "Dead-Ops Arcade," a 50-level zombie gauntlet that provides the ultimate undead challenge for fans of Call of Duty’s signature zombie warfare. Play solo or join a team of up to 4 players as you mow down hordes of zombies with Call of Duty’s all-new interface, now featuring Voice Chat for the first time ever.